Oh, meringue, how you continue to make a fool of me. Meringue and I have a love/hate relationship dating back to my French cooking class in 2008 with Chef Francois. He taught us how to make delicately light and crisp (and let’s not forget “easy!”) Pavlova meringues with passion fruit. When it came time for me to replicate this marshmallow-y sweetness at home, I was left with a burnt pan of flat liquid egg whites. Hmmf! Two more failed attempts at tweaking the recipe, I broke up with meringue and wrote it off forever. When I found this recipe in Real Simple this month, I decided to give meringue a second chance. Maybe it was my craving for ice cream. Or summer peaches. Or Francois’ cooking. 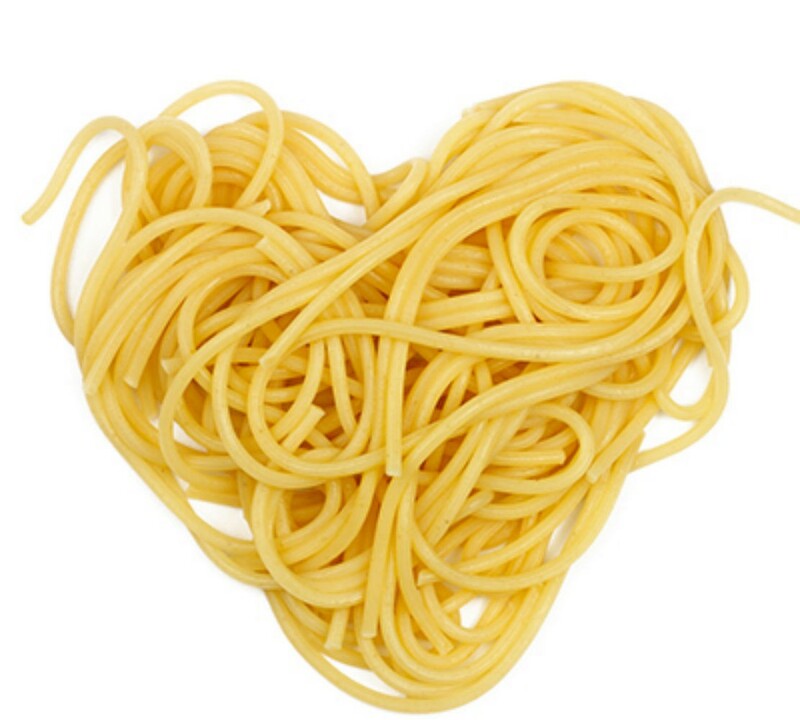 I don’t normally give second chances… I mean, it’s a break up for a reason… but I thought the recipe looked simpler. Then I quickly learned my dating mantra was yet again true when my roommate described my first attempt at Peach Baked Alaska as “melted Eggs Benedict.” Fail. But if you personally know me, I don’t give up on something I believe in. I believed in this Peach Baked Alaska. I researched tips for making meringue and Baked Alaska. And with my last peach, I succeeded! So follow my tips included in the recipe. It will keep it from looking like melted Eggs Benedict. Approximately an hour before you’re ready to serve the Peach Baked Alaska, place a baking sheet in the freezer. Wash, cut in half and pit the peaches. Put a large scoop of vanilla ice cream in the center of each peach like a bowl. Put peaches filled with ice cream in the freezer. 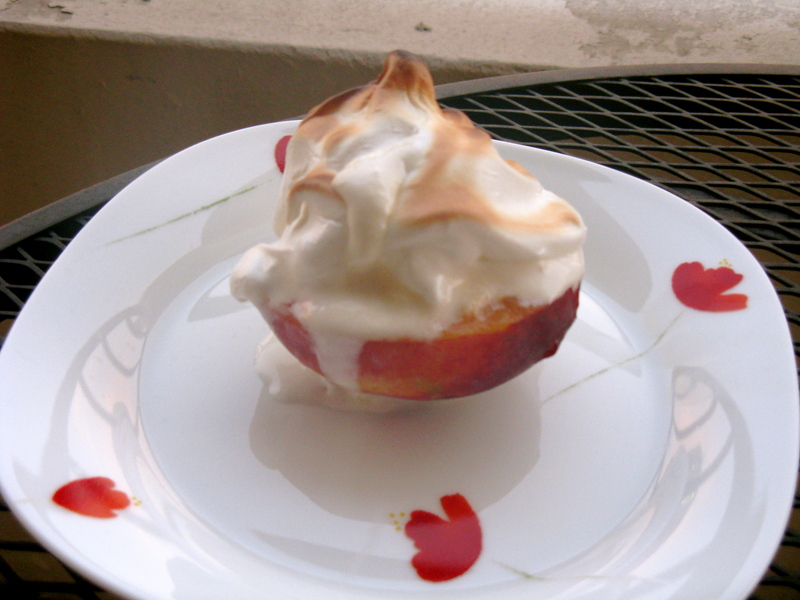 Tip 1: Freezing the pan and the peaches will keep the meringue from melting instantly off of the ice cream when baking. This will also give you the combination of frozen fruit, smooth ice cream and crispy, warm meringue when finished. When you’re ready to serve, preheat the oven on broil at 450 degrees. Tip 2: Broiling will cook the meringue a lot quicker than baking. If you wait for it to bake, the ice cream is going to melt. If you have a mini torch for creme brulee, you could also lightly torch the meringue. If you choose to use this method, I would skip the step of freezing the pan, peaches and ice cream since that is strictly needed for the oven! Separate the egg whites into a metal or glass bowl. Add a pinch of salt and beat with an electric mixer until foamy. Next, add the cream of tartar, and beating on medium-high speed, slowly add 1 tablespoon of sugar at a time over 2-3 minutes until meringue becomes smooth, glossy and stiff. Tip 3: It is best to use a metal or glass bowl when making meringue. Plastic bowls are more porous and tend to keep oils or grease even when clean. The slightest trace of oils can keep meringue from stiffening. Place frozen peaches on the pan from the freezer. Cover the ice cream with the meringue. Broil in the oven for 2-3 minutes until meringue lightly browns and becomes slightly crispy. Generously serves four!